Do you consider yourself sensitive to perfume? Harsh chemicals? Histamines? Or do you long for a stellar fragrance derived only from plants? Are you a mother awaiting the birth of your child and searching for a soft fragrance made just for you? I am elated to introduce a perfume house with those like you in mind. Founder of Ajne, Jane Hendler, along with her husband longed to create plant-derived fragrances, skin and body care. To that end, they planted an organic farm and eventually opened the doors to their shop in Carmel, California. Today, Ajne has received acclaim from the likes of Good Morning America, Cosmopolitan magazine, and Bergdorf Goodman. In fact, I was delighted to hear from Ms. Hendler at the Fall Ball in October 2007. Bergdorf Goodman supports the individualized approach that Ajne employs and made the stellar decision to carry the line in late March 2007. One glance through Ajne's website and little doubt remains as to the dedication of the founders to quality fragrances with organic derivatives. Incidentally, never have I seen more gorgeous, unique, Bohemain packaging! "The scent of the lavender harvest is captured in deLavande. Designed around a heart note of three distinct lavenders and set in a luscious base of smoky vanilla almond woods. deLavande contains the world’s purest lavender oils from Provence, Bulgaria and of course from our own spring fed organic farm in Carmel Valley. deLavande is as perfect for her as it is for him. If you feel drawn to Lavande, life is encouraging you to breathe deeply, speak your truth, slow down a bit and relax. " Such a gorgeous idea amidst a beautiful scent! 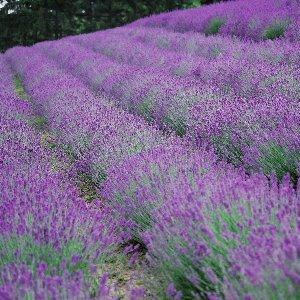 The high quality lavender headlines the fragrance with its rich, nurturing bouquet. Those smoky vanilla almond woods characterize the remainder of the scent and give it an earthy groundedness. As my friends Linda and Rob discovered at the Fall Ball, a heart note exists that resembles cinnamon, although I am certain it is simply the luscious lavender mixing with the precious smoky woods. As I continuously sniff my wrist to write this review, I am cloaked in a warm, gold blanket of calm and centeredness. Indeed, essential oils offer spiritual qualities yet plant-derived ingredients do not sacrifice intrigue at all in this case. I do not smell like a headshop. I smell like the breeze that blows the fields of lavender as it blooms during the summertime in response to the warmth of the sun. I smell like the rich, sweet and fertile earth from which it grows. And I smell like tranquility. Ajne deLavande is available on the website in .5 to 1 fl. oz. sizes ranging from $80-$130. It is also available at Bergdorf Goodman. Image of ajne products courtesy of ajne.com; lavender courtesy of stressdynamics.com. Girl, I couldn't believe my eyes! You and lavender? It must be really special :) Your description is so lovely it makes me crave it. Enjoy!